Well folks. 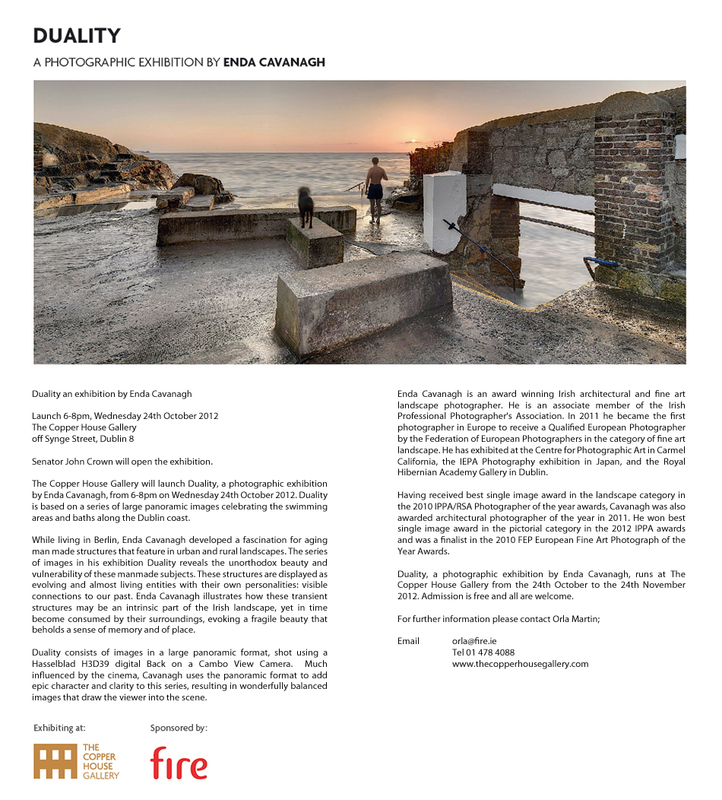 Here is an invitation to my exhibition Duality of 11 huge acrylic panoramic images of the old Dublin swimming baths and areas. All are welcome. Admission is free and it should be a great night. The Copper House Gallery will launch Duality, a photographic exhibition of my work, from 6-8pm on Wednesday 24th October 2012. Duality is based on a series of large panoramic images celebrating the swimming areas and baths along the Dublin coast. Senator John Crown will launch it and I’m donating a piece to cancer research which will be auctioned off at a charity event. While living in Berlin, I developed a fascination for aging man made structures that feature in urban and rural landscapes. The series of images in my exhibition Duality reveals the unorthodox beauty and vulnerability of these manmade subjects. These structures are displayed as evolving and almost living entities with their own personalities: visible connections to our past. I illustrate how these transient structures may be an intrinsic part of the Irish landscape, yet in time become consumed by their surroundings, evoking a fragile beauty that beholds a sense of memory and of place. Duality consists of images in a large panoramic format, shot using a Hasselblad H3D39 digital Back on a Cambo View Camera. Much influenced by the cinema, I use the panoramic format to add epic character and clarity to this series, resulting in wonderfully balanced images that draw the viewer into the scene. Duality, runs at The Copper House Gallery from the 24th October to the 24th November 2012. Here is a link to the Copper House Gallery website with the selected works in the exhibition.